Are you to ready take some mouth-watering charcoal grilled burgers? It may look like another "karinderya" ready to serve home-cooked meals at first look but NOPE, it's a DELICIOUS BURGER HOUSE. Gino's Burgers began its operations last year, 2011 and making it's name more popular in 2012. It is located along Lapu Lapu Street Corner Sobrecarey Street, Davao City. 100 years of HAPPINESS. 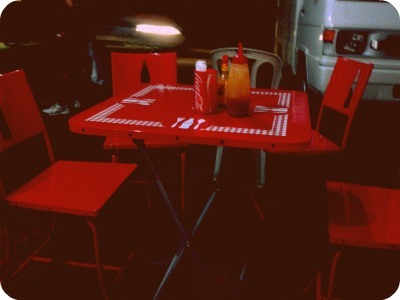 I love their Coca-Cola chairs and tables. So here goes, I got myself an A1 Burger (100% lean beef patty, melted cheese, lettuce, tomato, onion and of course, the A-1 steak sauce), P110 only. Very affordable for its taste! I think it took 12 minutes for grilling and preparation. Hungry! 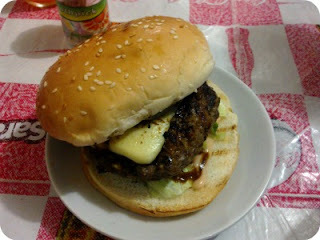 The beef -- Super SARAP! It's tender, juicy and absolutely yummy! Don't forget to put on "hot sauce" or "ketchup," it brings out MORE flavor! They have a wide array of burgers to choose from. Price ranges from P80 (regular burger) to P185. 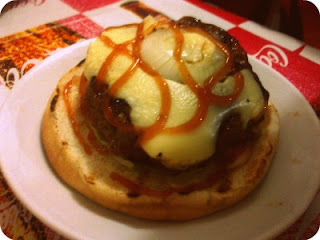 They also have Giant burgers that costs around P300 (Giant Regular Burger) to P450 (Giant Pizza Burger). For sidings, they have fries, onion rings, etc. For students and budget conscious, they have a burger meal for only P120. 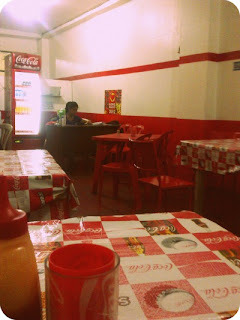 The burger is served with fries and regular "coca-cola" beverage. I believe that customer service should always come first when dealing with clients and customers. When you're in the business, be polite when talking to your customers and do not just give them a "nod" when they are asking for help and assistance. The smile painted on your staff is what the customers see from the beginning and not the taste of your food. So in order to give your client a good impression, start with a good customer service relation. Overall, food is great but needs improvement when it comes to dealing with clients. Honestly, we have visited the place twice and got the same impression. Maybe, they're just tired.